This post is the start of something new and different for this blog. Many people are writing about the drought in California, but I haven’t seen anything that tries to tackle the whole story: what does it mean for the future of the state? Is this what’s in store for California? 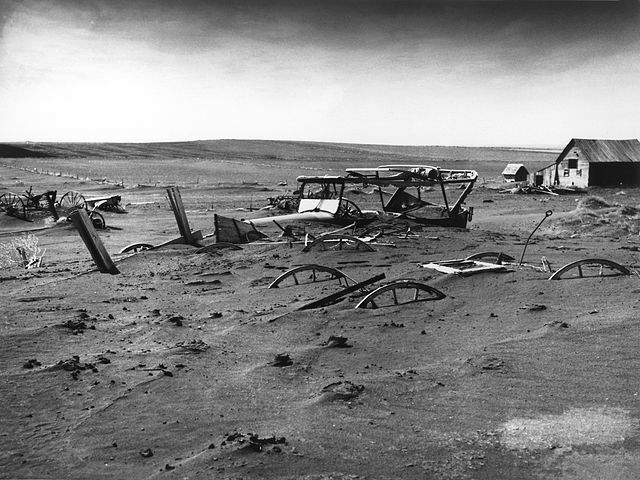 Dust Bowl, Dallas, South Dakota. Work found at https://en.wikipedia.org/wiki/File:Dust_Bowl_-_Dallas,_South_Dakota_1936.jpg . I got interested in the question because a family member wants to move there. I have written a couple of posts on the drought in California, and having recently watched Ken Burns’s documentary on the Dust Bowl, I began to wonder: is it smart to move to California right now? Or is it like moving to Oklahoma at the start of the Dust Bowl? I started looking for the answer and guess what? I couldn’t find it. I couldn’t find anything that tried to survey the whole situation, to put an estimate on just how big the California water deficit was going to be. I didn’t find anything that said whether they would be able to cover the deficit by gaining additional water and conserving the water they had. As I researched, it became clear very quickly that nobody should die of thirst in California. Only a small portion of their water is directly consumed by people. The question quickly became: what will happen to the California economy? Procuring additional water and conserving the water they have will put significant burdens on the state. Some of them will be financial, through increased expenditures for water. Some of them will be lifestyle burdens. California is famous for a certain type of lifestyle, and millions of people have moved there to have it. Will they have to switch their lovely landscaping to desertscapes? Will they have to give up their lovely pools and golf courses? Will they have to capture used grey water and use it for other purposes? Will they have to reduce the number or length of showers they take? Will they have to stop washing their cars? Will they have to limit the number of new residential and commercial water services? Will California melt away? Adapted from a map by the Oregon Climate Service via the Western Regional Climate Center. What will all this do to California? Will people brush it off like it was nothing? Or will it cause an economic recession? Will people continue to move to California, or will they begin to move out as life becomes too hard? I couldn’t find a resource that attempted to answer these kinds of questions. And the more I looked, the more interested I got. This series of posts is the result. As I write this introduction, the series has grown to 7 parts, and I’m working on the eighth. I’m about to be away from posting for a month, but I’ve set the posts up so that they will continue to appear once weekly at the normal time. I hope you enjoy them. Now, I want to say something about the limitations of what I’m attempting here. The data for these posts comes from a dozen or more different disciplines, none of which are my personal profession. I have tried to search out data sources that were sufficiently reliable, but there are some limitations and problems. Think of what is being attempted here as a gigantic “back-of-the-envelope” calculation. Do not regard any of the estimates as anything more than “ballpark” estimates, and the same for conclusions based on those estimates. Warren Buffet, the “Sage of Omaha,” has famously said that it is more important to be approximately right than to be precisely wrong. I have tried to follow that principle: it is more important to catch the general idea of what may happen in California than it is to know the precise cost of desalinated water from the Carlsbad plant, or the precise number of almond groves that will be abandoned. I have had to rely on public data sources that I could access over the Internet. Much of it is high quality, but not all. I have had to combine data sources that were not meant to be combined. They may have come from different years, or used different data collection methods, or partially overlapped in what they counted. Summations and comparisons using such data are bound to be problematic, but in most cases the data didn’t contain enough information to allow me to make adjustments. Perhaps the most serious issue involves the projected future decline in the California snowpack. 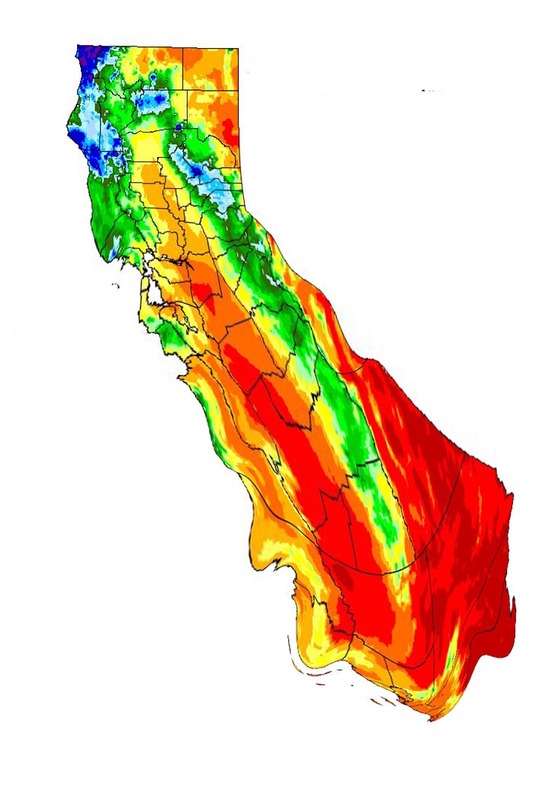 As I already reported in a previous blog post, the National Climate Assessment expects the California snowpack to decline by 40% by mid-century. I have understood their projection to mean that there will be a 40% decline in the amount of water from the snowpack that will become dedicated supply. But that may not be accurate, and none of the sources I looked at had the information. So don’t buy-in to what you see in the coming posts too heavily. They are just estimates by a guy who wanted to know what to say to a family member who wanted to move to California. I couldn’t find the answer anywhere, so I constructed one myself. I hope you enjoy the series. By mogreenstats in Climate Change, Consumption and Supply, Other Climate Change, Water on 2015/06/24 .